Nick was right: I did laugh when I heard him talk about — maybe even give slight praise to? — Reed Richards as a father. I also loved how Hannah talked about X-men 24: The issue that made her fall in love with comics because of their ability to have transcend the super-hero genre. For my love letter, I wanted to strike a balance between these two items, while at the same time, share my feelings for an amazing creative team. My love letter is to Chris Samnee, Matt Wilson and Mark Waid — the longest running creative team on Daredevil, aka Red Batman. I know that on the show I tend to talk about Daredevil a lot — way less than I want to if I’m being honest — and that I have thrown some shade at other characters that share some traits of the Crimson Crusader. I am going to indulge in this particular love letter because Daredevil has been, and will always be, my go to super-hero. Not because he’s a blind-Irish-ninja-lawyer, but because he reminds me of family that I love and miss. And The Samnee-Wilson-Waid team have, more than almost any other creative team, have written a book that hits a chord with me on many different levels. If you have Marvel Unlimited, look up Daredevil #10 from November 19, 2014. This is issue that is the cornerstone for this love letter. Here we see Matt fighting the Purple man — one of Marvel’s scariest “street level villains.” The same villain we will see in the upcoming Jessica Jones Netflix show, but I digress. Here, we have the standard DD-falls-and-gets-back-up motif, this time with the Kilgrave giving the beating. But that’s not how the issue opens. The issue opens with a very personal account of what depression feels like. Mark Waid makes it clear that some of these experiences are autobiographical, but even if in this case Matt isn’t speaking for Mark, he is speaking for me. Nick pointed out that DD shares the same place in my brain as my dad. That’s accurate. But for reasons that go beyond the Irish-ninja bit. I lost my father to Leukemia 12 years ago and my mother to breast cancer 11 years ago. And when those losses were fresh, I felt nothing. I was numb. It was an effort to breathe. It was an effort to move. This first fight scene, beautifully illustrated by Samnee and Wilson, is what I went through when I lost my folks. Except I didn’t have vibrant art or beautiful words to make the point. I had two things — again, brought to bear in issue 10. The first was enough will to fight. Though, in my case, it wasn’t a kick to the Purple man’s in the chest: It was a fight to go get the help I needed. For most super heroes, the will to get up and fight is enough. To get back up and keep going, as if willpower alone is some sort of magic power that can sustain you indefinitely. But that’s not the full story, not in real life. And to illustrate that point, at the end of the comic — after the letters page, which is the traditional end to a comic — Samnee, Wilson and Waid show us that Matt is more like us than any other street hero. The “end” of Issue 10. How many of us who have struggled with depression have done that? Lie to our loved ones and tell them that we’re fine. Then we crawl into bed only to be absorbed by the numbness? 12 years after my dad has gone, 11 years after I lost my mom, 10 years after I finally beat depression, I still have those days. 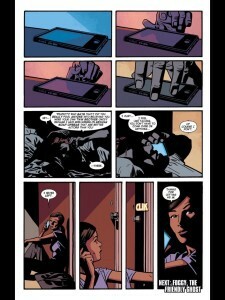 At the “end” of the book (after the letter pages) we get a series of panels wherein Matt struggles to reach his phone. The real ending of the issue, wherein Kristen is awesome. Not because he doesn’t know where it is, but because he’s struggling with depression: The emotional manipulation that is Kilgrave’s power set has drudged up Matt’s constant, most relentless foe — depression — and the standard macho-hero thing to do is to suffer in silence. Instead, he reaches out to Kristen and tells her that no, he isn’t okay, but he is now ready to talk and he invites her over. It turns out she never left. At my worst, I had those same friends and family. Ones who waited for me to let them in. Whether it was on my couch because they wanted to make sure I was okay, to friends on the other side of the country. Kristen represented all of that in those beautiful panels. And its those panels that make the difference. 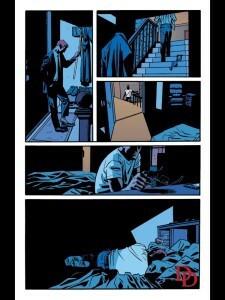 Waid’s a brilliant writer, but being a visual medium, it’s Samnee and Wilson’s art (lines and color respectively) that composed this beautiful scene-book-series. 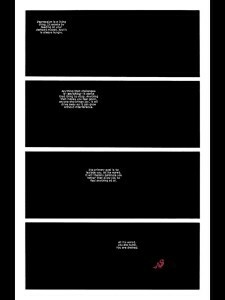 From the way they draw how depression feels, to show us how Matt “sees” sound, to the end where Kristen is waiting outside his door, this comic shows everyone how comics can transcend the super hero genre. As a team, Samnee, Wilson and Waid make Daredevil soar above and beyond any other hero book I read. So that’s my love letter. Samnee, Wilson and Waid took my hero, the one who shares the same space with my dad — my other hero — and made him just like me. Or just like us. Minus the whole ninja part.